As Indians (especially north Indian), I kind of grew up eating wheat and rice as the two main grains. And since it was the same for my husband too, we kind of carried forward the tradition. 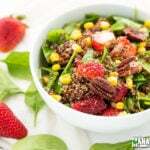 But now I am trying to incorporate more grains in our diet. And quinoa has become a regular in my weekly rotation. It’s rich in protein, fiber and nutritious! Earlier, I wouldn’t make it very often. The reason was not because Sarvesh didn’t like it (well he still isn’t a fan) but mainly because I had to monitor it on stove top and I didn’t like doing it. 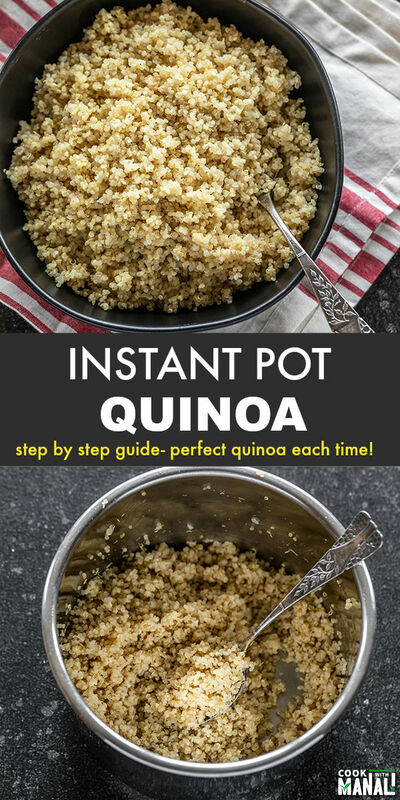 But now with my Instant pot, it’s a breeze to make quinoa in no time! The best part? I can walk away from it as the quinoa cooks. No monitoring and I absolutely love that. These days I make a batch and then store the leftovers in the refrigerator. 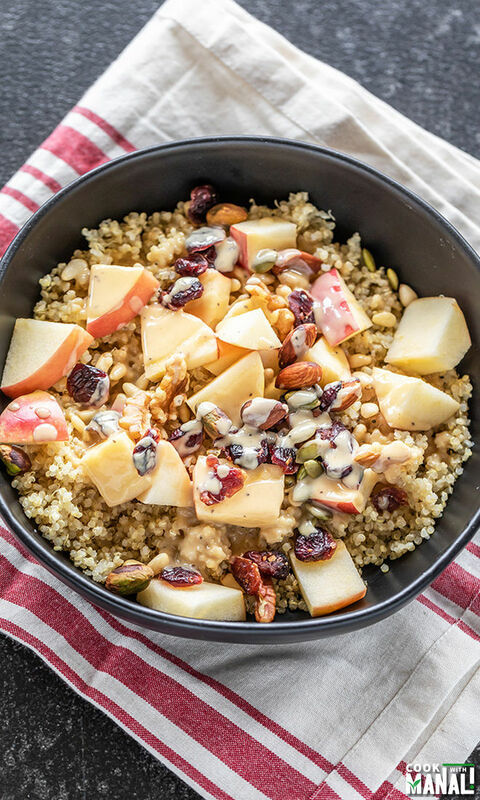 The cooked quinoa stays well in the refrigerator for 3 to 4 days. So when I want to have a healthy lunch, I can just pull out the cooked quinoa from the fridge, add some dressing and enjoy my salad. It’s great for meal prep. Even though I don’t really meal prep, this is the only thing that I do and it makes me eat a healthier lunch. ✓ super easy to make in the IP! ✓ zero monitoring, just add everything to the pot and you’re done! 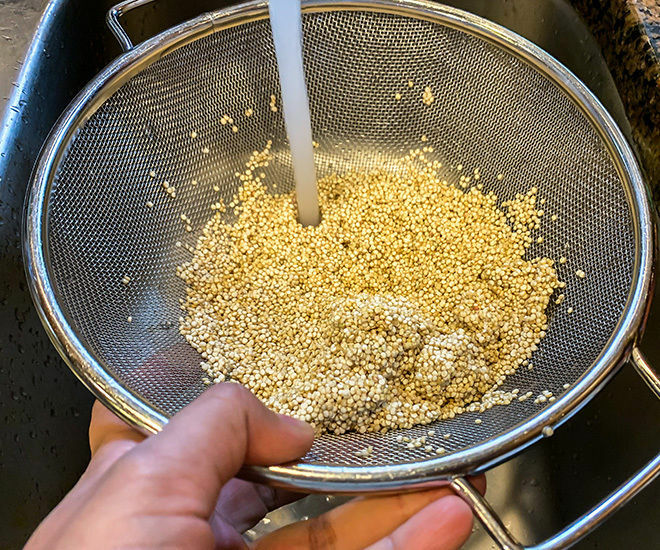 Start by taking 1 cup (185 grams) of uncooked quinoa in a colander. Rinse under running water for 2 minutes. 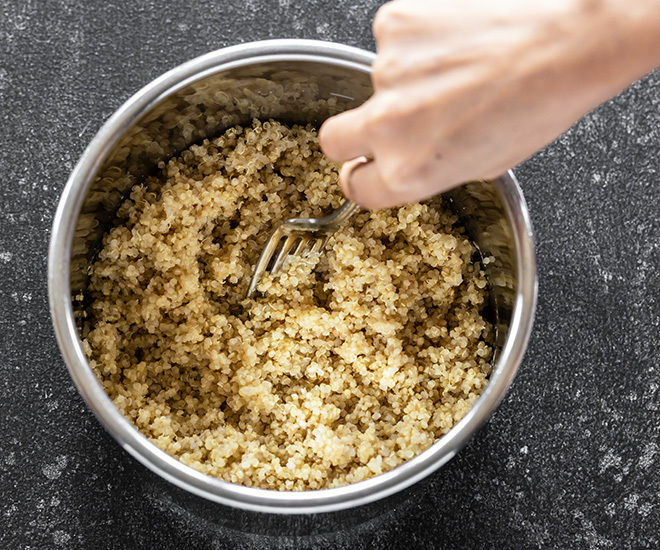 Rub the quinoa with your hands while rinsing it, this is important so that it doesn’t taste bitter when cooked. Once rinsed let the water drain completely. 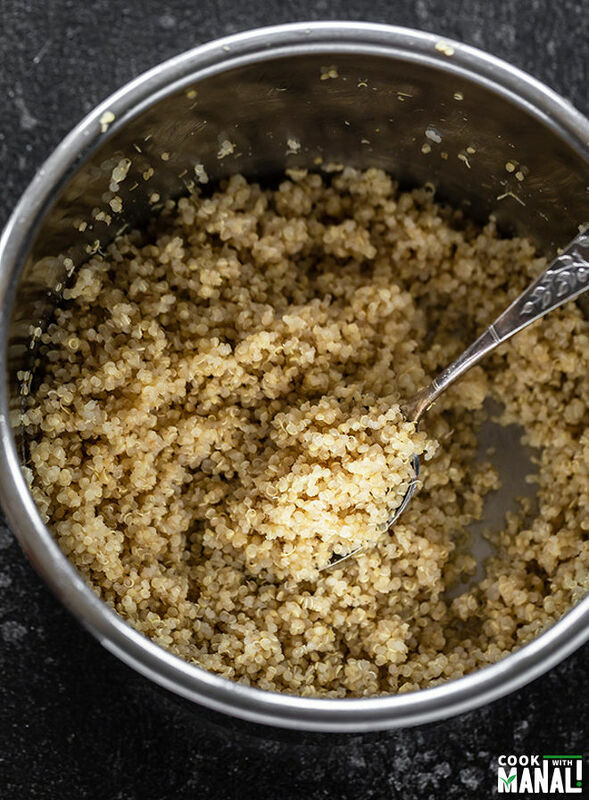 Then add the rinsed and drained quinoa to the inner steel pot of your instant pot. Add 1 1/4 cups (10 oz) water to the pot. Close the pot with its lid. Press the manual or pressure cook button and cook on high pressure for 1 minute, with the pressure valve in the sealing position. Let the pressure release naturally. Please note that 1 minute high pressure doesn’t mean that the quinoa cooks in 1 minute! The pot takes time to come to pressure and then also takes time to release pressure naturally. So it takes around 15 minutes for the quinoa to cook. Once the pressure releases naturally and the pressure pin drops down, unplug the pot. Open the lid and let the quinoa cool down a bit and then fluff with a fork. The quinoa will get fluffier as it cools down. 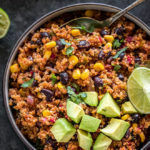 Store cooked quinoa in the refrigerator for 3 to 4 days. Enjoy in salad or with curries/dal! 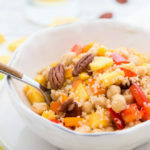 If you’ve tried this Instant Pot Quinoa Recipe then don’t forget to rate the recipe! You can also follow me on Facebook, Instagram to see what’s latest in my kitchen! 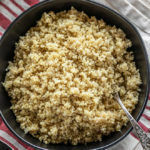 Step by step guide to make the perfect quinoa in the Instant Pot each time! Start by taking 1 cup (185 grams) of uncooked quinoa in a colander. Rinse under running water for 2 minutes. Rub the quinoa with your hands while rinsing it, this is important so that it doesn't taste bitter when cooked. 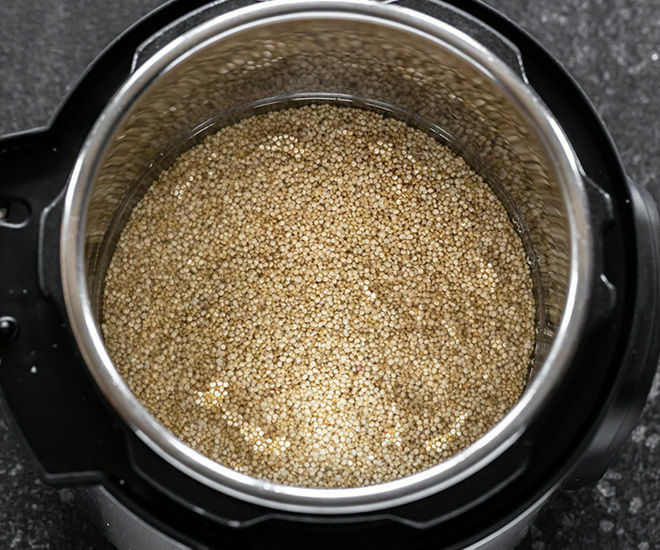 Please note that 1 minute high pressure doesn't mean that the quinoa cooks in 1 minute! The pot takes time to come to pressure and then also takes time to release pressure naturally. So it takes around 15 minutes for the quinoa to cook. 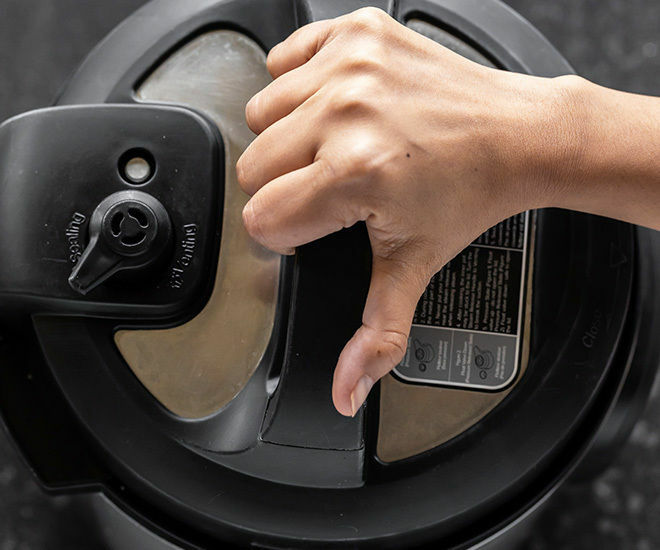 Once the pressure releases naturally and the pressure pin drops down, unplug the pot. Open the lid and let the quinoa cool down a bit and then fluff with a fork. The quinoa will get fluffier as it cools down. 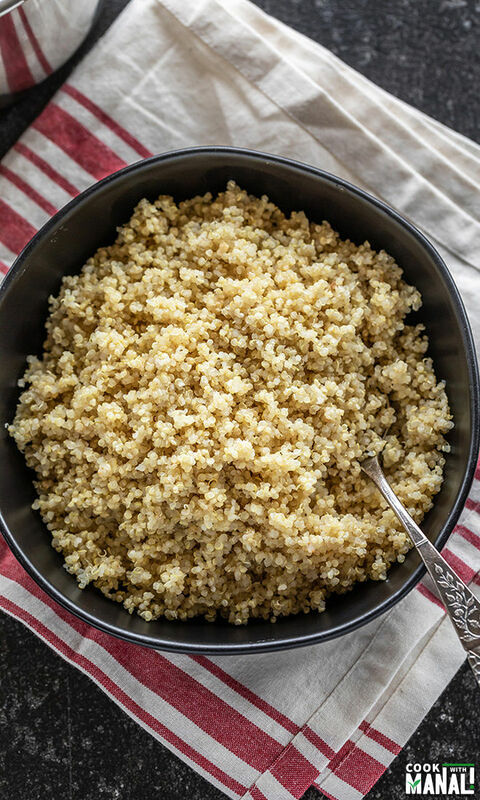 You may use vegetable broth in place of water to cook the quinoa. 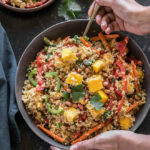 You may also flavor the quinoa with spices like turmeric or add some herbs to it. The quinoa will get fluffier as it cools down. So just let it cool down and then fluff with a fork.